Stat Mech posted information regarding intercepted signals and the killings of Jews in the USSR in the Summer of 1941. I remembered a statement released by Churchill regarding this sometime in November of 1941. For the first time in his experience mass murder has become unprofitable. He retaliates by the most frightful cruelties. As his armies advance, whole districts are being exterminated. Scores of thousands, literally scores of thousands of executions in cold blood are being perpetrated by the German police troops upon the Russian patriots who defend their native soil. Since the Mongol invasions of Europe in the sixteenth century there has never been methodical, merciless butchery on such a scale or approaching such a scale. And this is but the beginning. 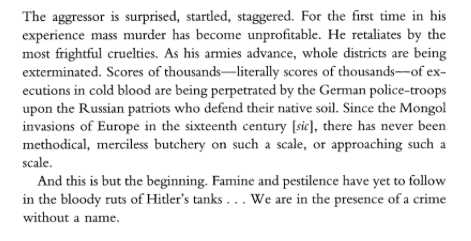 Famine and pestilence have yet to follow in the bloody ruts of Hitler's tanks. None has suffered more cruelly than the Jew of the unspeakable evils wrought on bodies and spirits of men by Hitler and his vile regime. The Jew bore the brunt of the Nazis first onslaught upon the citadels of freedom and human dignity. He has borne and continues to bear a burden that might have seemed beyond endurance. He has not allowed it to break his spirit. He has never lost the will to resist. He got the Hunger Plan right though. Maybe the Nazi pestilence was more figurative than anything else.